Beautiful tall pink card features a damask top portion with scallop oval perfect for framing the lucky girl's monogram. 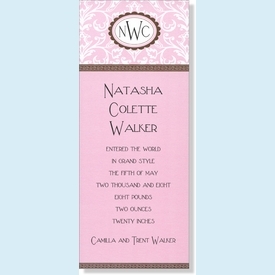 Brown accent borders and pink base for adding your personalized information. NOTE: Only 4 sets left! Optional: bronze pockets available; please inquire.